Welcome to Montgrí 13, the window to a world of possibilities. Located in San Rafael (Ibiza), the 2,100 m² estate includes a tennis court, swimming pool and a garden with spectacular panoramic views of Ibiza. The house is equipped with air conditioning, two fireplaces, fully fitted kitchen, satellite television and all other home comforts. 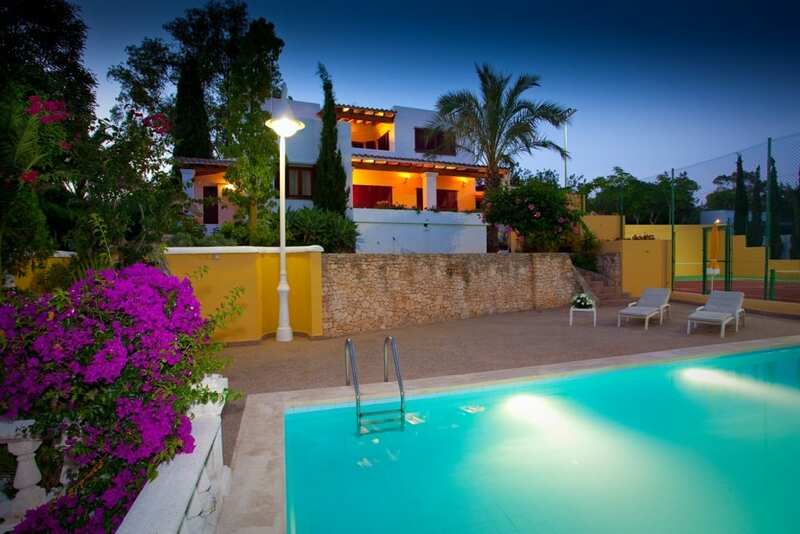 The villa is made up of three main areas: the house, a vast amount of garage space and a large communal room. 660 m² and 6,30m high provides many opportunities for undercover space. The garage space includes two independent cisterns for collecting 280 and 90 tonnes respectively of rain water and a wine cellar/storage room of 20 m². 110 m² living-dining room including pantry and cloakroom, commercial kitchen fitted with traditional Ibicenco oven and a spectacular fireplace where friends and family can gather round the table. The villa is part of a 2,100 m² estate including garden, terraces, tennis court, two-dog kennel and swimming pool with amazing panoramic views of Ibiza Town. The villa is located in Club San Rafael, San Rafael (Ibiza) which is one of the white villages of the magical island of Ibiza, crowned by its beautiful church.